Posted on Tuesday, November 8th, 2011 at 7:20 pm. 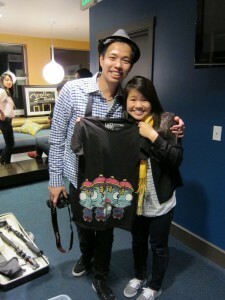 TaiwaneseAmerican.org’s Ho Chie Tsai chats with YouTube artist Kevin Lien and sponsor Samuel Wang, one of the co-founders of Akuncture Clothing. 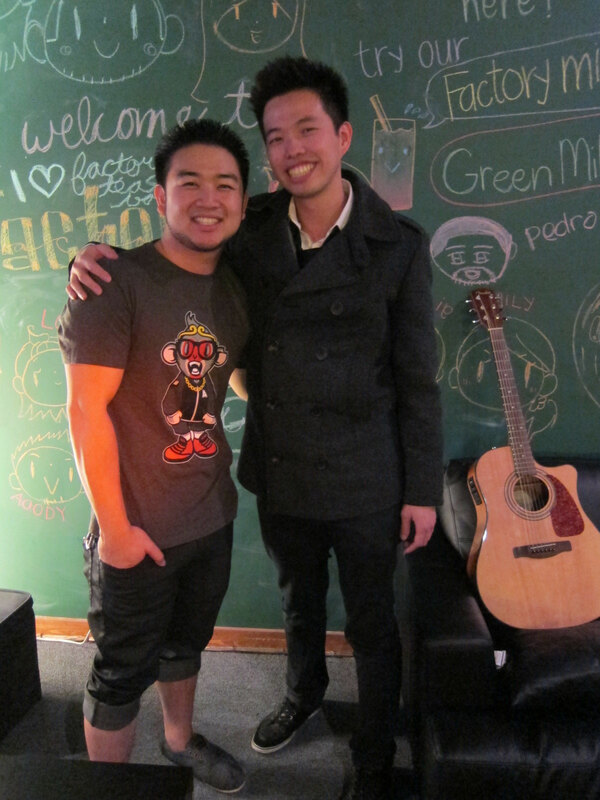 Both are Taiwanese Americans who hope to make an impact on the greater community by sharing their creative talents. 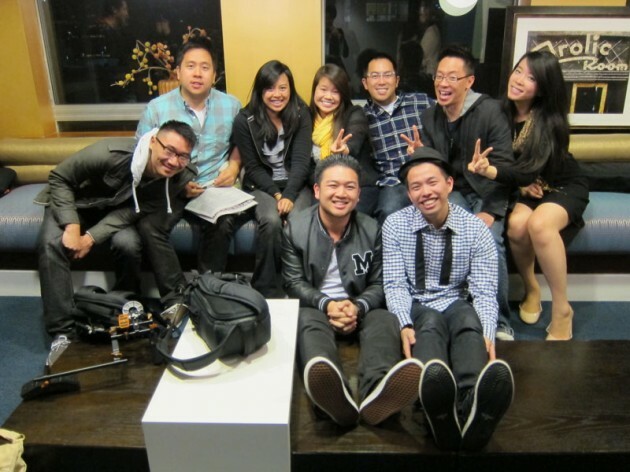 We recently brought together our TaiwaneseAmerican.org team along with some of our co-collaborators in LA to attend one of Akufuncture’s OSMOSIS performance series showcasing talented Asian American artists. 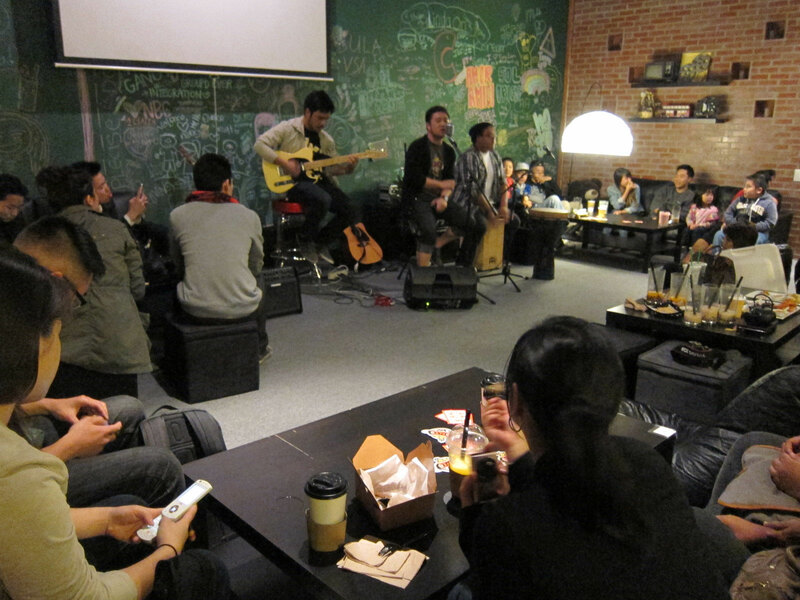 On this unusually cool and wet Friday night in San Gabriel Valley, we made ourselves at home in the cozy and warm Factory Tea Bar to listen to featured performer, Taiwanese American Kevin Lien. Kevin has found a solid following on YouTube, with over sixty thousand subscribers. Some of his videos and covers songs have garnered about a quarter million hits. Check out his YouTube channel, listen to his voice, and you’ll see why he has such a loyal following. We’ve known about him for some time now, but it was only recently that we discovered that he was of Taiwanese heritage. Speaking to him, one quickly realizes that he is quite proud of his Taiwanese American background. 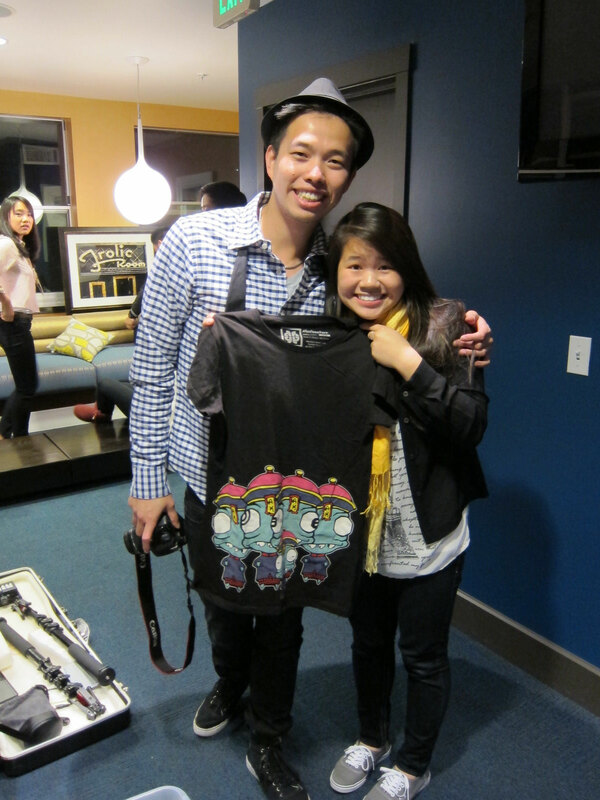 Akufuncture’s co-founder Samuel Wang is a talented and visionary individual with a flair for fashion. He speaks proudly of his Chinese and Taiwanese backgrounds, and it is from this broader experience that he finds inspiration to bring a fashion-forward consciousness to the world of urban Asian-inspired clothing. Established in 2009, Akufuncture “aims to create a clothing line that brings to life a culture with much influence” by creating designs that tell the broader Chinese-inspired “historical and cultural stories.” The company has done quite well for themselves, with orders coming in from the U.S., Canada, and overseas. But more importantly, Samuel has made it a point to help support both well-established and up-and-coming YouTube artists through sponsorships. When he speaks about building up the Asian American community, one senses that he is driven to make a difference. Look closely at other popular Asian American YouTube artists’ videos, and you might find them sporting the Akufuncture brand. TaiwaneseAmerican.org is pleased to support both of these passionate creators in what they do. Look forward to some future collaborative projects with the Akufuncture family! TaiwaneseAmerican.org, Turtlist Media, Seaglass Cinema, and tafLabs bring together our soon-to-be-launched young talent, Alison Yeh, with Akufuncture’s Sam Wang and singer Kevin Lien.